2747 N Clark construction has begun on an improved two-story retail building. Several retail spaces have been filled, renovated or vacated while major new construction near the corner is in play. DNAinfo covered the proposal to improve the two-story retail building at Clark and Diversey last fall. We passed by the corner over the weekend. The several corners of the Clark, Diversey, Broadway intersection have seen a lot of change over the past few years including Stan's Donuts and the newer Starbucks. West Diversey Parkway heading east toward the lake is prime for several redevelopment projects (some stalled) including the approved 56 units at 508 West Diversey. 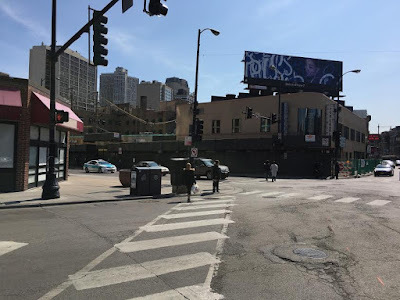 About 152 condo units have closed withing a two block radius of Clark/Diversey/Broadway intersection over the past 12 months. The median price of a sold condo is about $385,000. A 3,000 sq/ft duplex penthouse condo unit at 627 West Surf sold last summer for $1,323,894. We have many clients who have lived in the surrounding blocks for years. Some have sold and bought just a couple blocks apart to stay near all the retail and the lake!